With the new IEEE 802.11ah standard aimed at improving the existing WLAN standard for the machine-to-machine applications, there is a renewed interest from the research community to analyze and suggest improvements to the standard. With thousands of smart devices and sensors involved in an internet of things network, the interference from multiuser access becomes a serious issue. 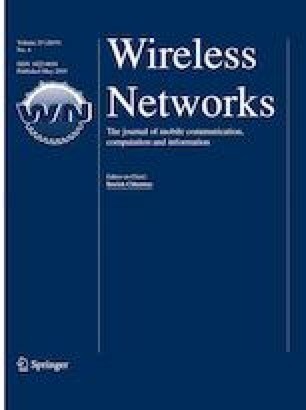 This paper presents an access point (AP) coordinated multiuser access mechanism for such applications, where the strategy to improve channel usage efficiency is based on analyzing interference present in the neighborhood. Interference experienced in such a system is a function of node location, transmitted power, traffic load and resource allocation. In our proposed system, each WLAN AP from the overlapping basic service sets employs multiple frequency sub-bands and associates user nodes to these sub-bands dynamically. We show that this proposed interference-aware dynamic frequency allocation (IDFA) scheme, which is based on neighborhood contention analysis, can significantly enhance the system throughput and improve the energy efficiency by about 30%. In dense user node deployments, the channel access efficiency of the IDFA multi-band scheme is 2–3 times higher than that of the single band legacy WLAN. This work is supported in part by the Ministry of Science and Technology (MOST), Taiwan under Grant MOST104-2221-E-002-075-MY2.